Today you might be surprised by the new Google Doodle ‘GMMXIE’. Don’t go for a dictionary since I am here to unwrap the meaning of this latest Google Doodle. MMXI means nothing but 2011 in roman numerals. Standing at the threshold of a new year, Google has released this new doodle that shows MMXI in between the letters “G” and “E” of Google logo on its home page. This is no doubt an unique approach to welcome a new year by Google team. 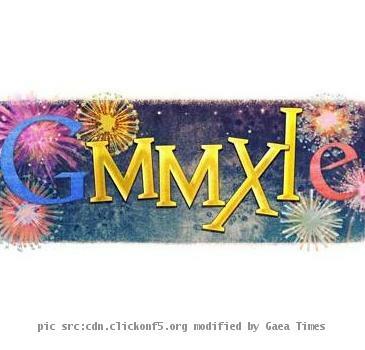 This colorful Google doodle ‘GMMXIE’ is preceded by handful of innovative doodles that Google had released in many occasions. Google team had released a doodle for holidays which was having more than 15 different cards. In addition, Google came up with video doodle, online payable doodle of PacMan game, Bouncing Balls doodle etc. Obviously, today’s Google doodle stands out of the other doodles. This doodle of roman numerals for 2011 is really cool considering the background that shows exuberant fireworks. It simply reflects the mood of celebration at the eve of a new year. We, at Gaeatimes wish you and your family a very happy and prosperous new year. Turkey Recipe Now In Google Doodle!